Kingdom Hearts II is the third game in the Kingdom Hearts series, serving as a direct sequel to Kingdom Hearts Chain of Memories. Like the two previous games, it focuses on Sora and his friends battling against the forces of darkness. The theme song for the game is "Sanctuary" (Japanese version: "Passion") performed by Utada Hikaru. Chronologically, Kingdom Hearts II is the eighth game in the timeline, after Kingdom Hearts χ, Kingdom Hearts χ Back Cover, Kingdom Hearts Birth by Sleep, Kingdom Hearts 0.2 Birth by Sleep -A fragmentary passage-, Kingdom Hearts, Kingdom Hearts Chain of Memories, and Kingdom Hearts 358/2 Days. Kingdom Hearts II begins almost a year after Kingdom Hearts Chain of Memories, and immediately after Kingdom Hearts 358/2 Days. A boy named Roxas wakes up in his room at Twilight Town. Roxas has dreams of Sora's adventures while increasingly mysterious activities begin taking place in Twilight Town during Roxas's summer vacation with his friends Hayner, Pence and Olette. After obtaining the Keyblade to defend himself from strange white creatures, Roxas comes in contact with a young man in black named Axel. Axel appears to know Roxas, though Roxas has no recollection of him. Roxas is unwittingly led to Sora, initiating their reunification. Roxas eventually makes his way into an abandoned mansion where a girl named Naminé informs him that he is a Nobody, like the strange white creatures, although he doesn't understand at the time. Finally, confronted by a mysterious, red-cloaked man called DiZ, Roxas discovers Sora, Donald, and Goofy sleeping in the hidden basement of the mansion, where they have been regaining their memories since their last adventure a year ago. Roxas merges with Sora, and Sora finally awakens, alongside his friends. Jiminy Cricket, who had previously chronicled the trio's adventures, finds that his journal is now completely blank, save for the note: "Thank Naminé", which Jiminy had previously left as a clue to their adventure in Castle Oblivion. The group begins their journey anew and arrive in the real Twilight Town, instead of the virtual simulation Roxas lived in. The group crosses paths with King Mickey Mouse, who orders them to board a train, before running off. In the station, the real Hayner, Pence and Olette say their farewell to Sora, who cries because of Roxas inside of him, although he does not understand it at the time. The train takes them to the Mysterious Tower. 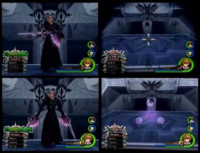 After meeting Pete, a new villain, and speaking with Yen Sid, the party is informed that they must once again visit many worlds to protect them from both the Heartless and the Nobodies in an attempt to stop Organization XIII. These include both old but greatly changed places, like Hollow Bastion, along with new ones. Sora gains new clothes and powers from Flora, Fauna, and Merryweather, and Yen Sid summons the Gummi Ship for them to use. After Sora, Donald and Goofy leave, Maleficent's Raven brings her tattered cloak to the fairies, who unwillingly remember Maleficent, activating the spell she left to resurrect herself. Sora continues his quest by unlocking paths to new worlds, learning of Nobodies and fighting the Heartless, as well as facing the remaining members of the mysterious Organization XIII. As the game progresses, Sora learns about Roxas and how much they have in common. He also gets leads that Riku may still be alive and out there somewhere. Meanwhile, it is also revealed Kairi is being dragged into the events by Axel, both of them eventually finding their way to Twilight Town. Although Kairi meets Hayner, Pence and Olette, she ends up being abducted by Axel and taken into a portal. Sora and his friends prepare to fight the army of Heartless. The Heartless, led in two separate groups by a revived Maleficent and the Organization, regain power, eventually forcing Sora to battle a massive army of Heartless that are attacking Hollow Bastion. Along the way, they learn that the Ansem they fought a year ago was actually the Heartless of Xehanort, and that the Nobody of Xehanort, Xemnas, is the leader of Organization XIII. They also learn that Xehanort was an apprentice of the real Ansem, who is missing. After the battle of the Heartless, Xemnas appears and leaves with a cryptic note that King Mickey knows where Riku is. When Xemnas leaves, another member of the Organization, Saïx, appears before the group and reveals their ultimate goal: the Nobodies' plan to create another Kingdom Hearts, a doorway to the heart of all worlds that will presumably allow the Nobodies to get their hearts back. Sora reunites with Kairi after a year. After confronting and defeating more members of the Organization including Axel, Sora goes to The World That Never Was to settle the score with the Organization for good. Sora blanks out and briefly battles Roxas in his heart. In the castle, he finally reunites with his friends Riku and Kairi, although Riku is in Ansem's body. Sora learns the truth about Roxas as well; he and Naminé are, respectively, Sora and Kairi's Nobodies, created when they lost their hearts in the original Kingdom Hearts game. The group cross paths with Mickey, Ansem the Wise and Xemnas. Ansem's Kingdom Hearts Encoder explodes, apparently killing him and returning Riku to his original form, and Xemnas has disappeared. Maleficent and Pete also appear to hold off a mass of Heartless so that Sora's group can fight Xemnas, and the duo are not seen again. Sora, Riku, and Kairi reading Mickey's letter. After defeating Xigbar, Saïx and Luxord, only Xemnas is left of the original thirteen members. Sora and Riku unite to defeat him. Confused how to return, Naminé appears and opens a portal which Mickey, Donald and Goofy pass through. Naminé reunites with Kairi, and a projection of Roxas reunites with Sora. However, it turns out Xemnas' defeat is a false alarm, and Riku and Sora have to finally defeat Xemnas. Afterwards, Xemnas' new Kingdom Hearts is closed. Sora and Riku rest on the Dark Margin. Sora and Riku inexplicably find a bottled letter from Kairi she sent before their reunion, and the Door to Light is somehow opened, which they pass through. Sora and Riku find themselves returned to their homeworld of Destiny Islands. The pair are welcomed by Kairi, Donald, Goofy and Mickey. Sometime later, Sora, Riku, and Kairi receive a letter from King Mickey. Sora fighting Heartless in his "Master" Drive form. Kingdom Hearts II offers a number of key differences from the original Kingdom Hearts. While the core gameplay remains the same, new features have been added to improve the experience. The HUD is more organized so that Goofy's and Donald's HP and MP are beside Sora's instead of a corner. The enemy's HP is no longer colored with pink, orange, green, yellow, etc., which made it confusing for players fighting enemies with a lot of HP to know how much health was left. Instead, the HP is entirely green, with sub-icons to easily indicate the amount of health. The camera is further away from Sora, allowing the player to see more surrounding area and enemies. The player can also tilt the camera up and down, which is impossible in the original PlayStation 2 release of Kingdom Hearts. The player can open Treasure Chests during battle and no longer has to defeat all the enemies first. Sora's Drive Form system allows him to fuse with one or both party allies and assume new powers. There are new and revamped Abilities, as well as special abilities, such as Glide, that can only be gained by leveling Sora's Drive Forms, giving incentive for players to use Drive Forms a lot. Occasionally, Sora may turn into a shadow version of himself known as AntiForm. Sora can not heal in AntiForm and is vulnerable, so the player should attack as much as possible to exit AntiForm. Reaction Commands allow Sora and/or members of his party to perform special maneuvers in the course of battle. The player can add shortcuts for both items and magic, while in the first game, the player could only add a shortcut for magic. The basic combat and leveling systems have also been redesigned. In order to facilitate low-level playthroughs, bosses no longer offer experience upon defeat; rather, they reward the player with boosts to their HP, MP, or AP, or with specific abilities. Bosses can no longer be defeated by mere depletion of HP, and must be finished off with a combo finisher; in fact, many bosses have the ability to break out of Sora's combos if they go on too long. This is one aspect that has made Kingdom Hearts II more challenging. The redesigned MP Gauge in action. The MP Gauge has also been retooled to ensure that the player is never left without magic. This now prevents abuse of powerful spells like Cure—instead of being a quickly refillable gauge that is difficult to refill during battle, the MP Gauge can easily be depleted by three or fewer spells, and refills automatically. Several abilities can empower Sora's offensive abilities during this period to compensate for his temporary inability to heal. The Trinity Marks and 99 Puppies from the first game have been completely removed. For collecting, there are Treasure Chests present in the first game, and it is now required that the player open every single chest in order to complete the Journal. If the player is playing the Final Mix version, there are 144 Puzzle pieces scattered throughout the world. Item synthesis is also retained from the original game, but has been made more complex by allowing the player to use catalysts in the recipe, as well as requiring the player to find hidden Recipes or training the Moogle in order to create the more powerful items. As with Treasure Chests, the Journal now tracks the player's prowess in the synthesis sidequest. Kingdom Hearts II also has a stronger focus on mini-games, as instead of merely rewarding the player with prizes for high scores, the player must meet certain minimum scores in each mini-game simply to fill the Journal. Certain mini-games, like Skateboarding, also appear in many variants throughout the worlds, while Atlantica has been converted into a mini-game world similar to 100 Acre Wood. The Gummi Ship is faster paced. Routes themselves are less uniform and monotonous, varying from space battles against a massive pirate ship, to flying through floating islands and waterfalls. There is more variety of music. A route is more akin to unlocking a "door" to a world, rather than a path that the player needs to travel back and forth between. Many new types of Gummis are available, such as Teeny Ships that fly alongside the main ship, and the Ships can equip abilities similar to Sora's. The Japanese release on the top, North American on the bottom. When Sora battles the Hydra in Olympus Coliseum, green blood gushes out whenever Sora harms it. The green blood was changed to black and purple smoke or drool in the English version. The green blood, however, is retained during the cutscene where Hercules is fighting it. Xigbar's telescopic sight was changed from a view with a cross-hair and black shading around the sides to three glowing circles. An attack animation was also altered; in the Japanese version, Xigbar combined his two hand-held guns to create a sniper rifle, which was used to shoot the player's party during the telescoping sight sequence. In the English version, Xigbar does not combine his guns, but twirls them around and shoots at Sora with a single gun, holding the other at his side. However, this was reverted in Kingdom Hearts HD 2.5 ReMIX. Axel's demise is slightly edited; in the original Japanese version, he bursts into flames during his suicide attack, and the flames are consuming his body as he fades away. At Disney Castle, while chasing Donald around for missing a date, Daisy pounds him on the backside in the Japanese version, while she simply tells him off inaudibly in the English version. When William Turner threatens to take his own life, he aims the gun at his head in the Japanese version, while he merely holds it at his side in the English version. Undead Pirates do not catch fire when affected by Fire magic, though the Grim Reaper still does (trying to light pirates on fire results in them running around smoking instead of burning). The pirate's muskets were modified to resemble crossbows, though the crossbows still fire with an audible musket shot sound effect. In the original Japanese version, the blood on the cursed medallions remains throughout the game, but disappears after Barbossa and Will drop them into the chest. In the Japanese version, when Jack Sparrow is stabbed by Barbossa, the sword sticks out of his chest as he staggers back into the moonlight. In the English version, the sword has been removed. When Barbossa tells Elizabeth of their curse, he mentions lust and women, which is removed in the English version and replaced by "pleasurable company". This is, however, the line used in the movie. Most of the key characters from Kingdom Hearts return, particularly heroes Sora, Riku, and Kairi, as well as constant party members Donald and Goofy. King Mickey also returns, having a much larger role in Kingdom Hearts II than his cameo at the end of the first game. Old foes also return, most notably Maleficent. A number of characters first featured in Chain of Memories also make comebacks in Kingdom Hearts II; most prominently involved are Naminé and DiZ. Axel of Organization XIII also makes a return appearance, the only member to appear in both games; the Organization members featured in Kingdom Hearts II are all new to the series. Also new to the series are the mysterious Roxas and Maleficent's lackey Pete. In addition to the Disney characters that return from Kingdom Hearts, there are also characters from several Disney features making their Kingdom Hearts debut, most notably characters from the previously unexplored worlds of Mulan, Pirates of the Caribbean, and Tron, as well as a world dedicated to Disney's older black-and-white works, Timeless River. New but familiar characters have also been added to all of the returning worlds. Other characters make prominent appearances in the original Kingdom Hearts worlds of Twilight Town and Hollow Bastion. Yen Sid the sorcerer, Mickey's master in the movie Fantasia, makes an appearance, inhabiting a mysterious tower. Flora, Fauna, and Merryweather from Sleeping Beauty give Sora his new outfit. Scrooge McDuck also has taken residence in Hollow Bastion trying to recreate a "salty flavored ice cream". Merlin returns to Hollow Bastion, now allied with several familiar faces from Traverse Town in the original game. Seventeen characters from six of the Final Fantasy games make appearances in Kingdom Hearts II. Along with returning characters from Final Fantasy VII, Final Fantasy VIII, and Final Fantasy X, characters from Final Fantasy VI, Final Fantasy IX, and Final Fantasy X-2 debut for the first time. It had been stated by game designer Tetsuya Nomura that, although the first game strictly stuck to characters Nomura designed, this time around they were going to "take some risks", allowing characters from Final Fantasy games without involvement from Nomura to make appearances. The involvement of characters from VI and IX are the result. The omnipresent Moogles, featured in many different Final Fantasy titles, return in Kingdom Hearts II as both the keepers of item synthesis, and also as shopkeepers at various places in worlds. However, because of the dangers of the world, they only appear as holograms, with the exception of the Moogles in Hollow Bastion and Twilight Town. Other constant Final Fantasy reference include Biggs and Wedge, who make appearances as shopkeepers, references to the Final Fantasy job classes in the names of the Nobodies, and the names of various Gummi Ship blueprints. Nobodies are the main enemies in Kingdom Hearts II, appearing alongside Heartless. They are creatures without hearts, born from the body and soul of a living being who has lost its heart. Organization XIII are Nobodies who have retained their human forms, albeit a bit changed from their original appearance. Another difference between the Nobodies and Heartless are that the Nobodies attack more tactically, and often together, unlike the instinctive nature of the Heartless. Many of the different kinds of Nobodies are named after job classes from the Final Fantasy series. Like the previous game, Sora can summon certain Disney characters to aid him in battle once he has attained each of their respective items. As summons use the Drive Gauge instead of the MP bar, Sora cannot Drive and summon at the same time. The summoned character will replace the two computer-controlled characters and fight alongside Sora for as long as the Drive Gauge allows. Instead of the summoned character being limited to only one action, the summoned character now has a menu of his own to perform multiple actions, some solo actions and some cooperative actions with Sora. There are four summons total in Kingdom Hearts II, Chicken Little, Genie, Stitch, and Peter Pan with additional help from Tinker Bell. World-specific party members appear in almost every world in the game; there are nine in total, offering a huge leap from the original game's six. Notable among them are Auron, the first Final Fantasy character to be a party member, and Sora's best friend Riku. Also notable are assistance characters, who are not part of the party, but can fight alongside of it; they usually appear during key battles and plot moments. Kingdom Hearts II Final Mix is an enhanced re-release of Kingdom Hearts II featuring more enemies, additional scenes, and many other elements like expanded worlds. In Japan, it was released in a package called Kingdom Hearts II Final Mix+ also containing Kingdom Hearts Re:Chain of Memories, which gives the player access to more cards if there is a cleared Kingdom Hearts II Final Mix save file on the memory card. The Final Mix version of the game was ported to PlayStation 3 as part of the Kingdom Hearts HD 2.5 ReMIX. It was later ported to PlayStation 4 as part of the Kingdom Hearts HD 1.5 + 2.5 ReMIX. In the English version, Sora's Wisdom Form differs from that depicted in the Bradygames guide, in that the pattern on his pants is different. If players look closely, the pattern resembles Sora's Master Form rather than its own design. This page was last edited on 19 April 2019, at 02:26.